It's good to know that the power in prayer is in the One Who is all powerful! The One with whom you are communicating through prayer is important and He's not concerned with the exact wording but with our hearts and simply spending time hearing us communicate with Him. He's not impressed or extra-moved by "perfectly" worded prayers. So, don't worry as much about wording but focus instead on how and with whom you're communicating. Take the pressure off of yourself and humbly and honestly approach Him with prayer. Purpose to simply pray and communicate from your heart to God, the One who hears your prayers along with His Son our one and only mediator between God and ourselves as well as with His Spirit who intercedes for us as well! What prayer team we have each time we pray! 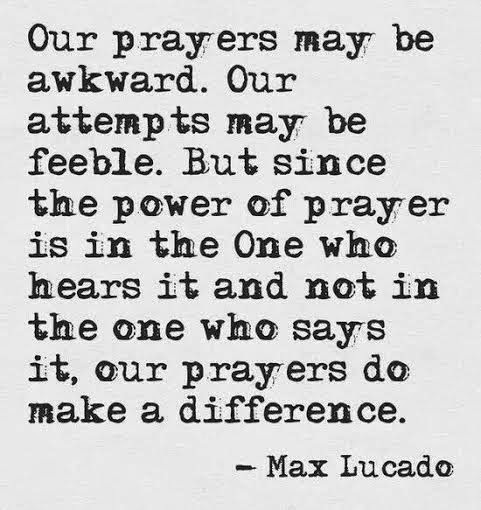 Your prayers do make a difference! Keep on praying! Stop Remembering What God Has Forgotten!